Rajgor’s Coin Festival from 7th to 10th December, had numismatists, students and history buffs coming in droves to see the history of this tiny State revealed through its coinage. 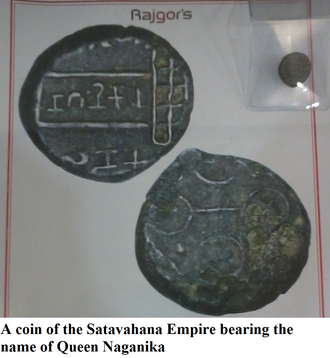 Among the coins on display was a copper coin dating back to 1 AD from the Satavahana Empire, which shows the name of Queen Naganika as Nagamnikaya in a Brahmi legend in the centre. It is the earliest evidence of special coins being issued in the name of a queen and certainly denotes the political power she may have wielded in an era that promulgated the dominance of men. The Kadambas were a powerful dynasty in Goa, beginning their long rule in 10th century with Shashtadeva I. Their gold coins bear the Sinha Lanchana or ‘lion crest’ and in some instances have the name of their family god ‘Saptakotishwar’ (Shiva) inscribed on them. These coins were made of pure gold and were called Bhairava- gadyanakas or Saptakotisha-gadyanakas (76-86 grains). The smallest gold coins were called panas (6 grains). During the Vijaynagara rule what was half of the gadyanaka came to be known as pratapa. These pratapas in turn were known as pagodas and pardaos during the Portuguese rule. The Kadambas may have declined in supremacy over Goa with the onslaught of the Yadavas of Devgiri and the Muslim rulers of the 14th century, but they have left proof of their prosperous times by way of these gold coins. Coins from the Bahamani Empire, during the reign of Ahmad Shah II were also on display. However, it was the coinage and currency of the Portuguese era that intrigued the aficionados of history and currency on day three of the exhibition, as Dr Luis Francisco Dias lectured on his ancestral home – Casa da Moeda (house of coins) or the mint house of Goa (1834-1841). The earliest known owner of the house was João Batista Goethalis, who dealt with a trade ironically juxtaposed against the medical profession taken up by Dr Dias’ ancestors. He was in the business of selling tobacco. It later became the Fazenda Pública (treasury). After serving its purpose as a mint it was sold to António Inácio da Silva of Santa Cruz, who rented it to the English telegraph from 1865-1902. Dr Dias humorously suggests the premise of a spy thriller as the Portuguese telegraph may have operated out of the house around the same timeline. In 1904, the house came to the Dias family as it was sold to the eminent Dr Minguel Caetano Dias, great grandfather of Dr Luis Dias, who was highly honoured by the Portuguese and given the title of General. He was furthermore commended and decorated for his excellent work in ridding Panaji of the bubonic plague. Portuguese chronicles present the establishment of a mint house as meeting the need of the natives to assuage the scarcity of coinage. It is said a delegation of chiefs approached Albuquerque for the same. Alfonso de Albuquerque saw the mint house as the consolidation of his 1510 victory over Goa. Coins of various denominations of gold, silver and copper were struck and were known as Cruzados or Manueis, São Tome, in honour of St Thomas, or Patacões, Bazarucos and Xerafins, which was the corruption of the Persian Ashrafi meaning noble. There were also Tangas and Bastiãos. Goa was the first Portuguese colony to have a mint house. Malacca followed suit in 1511 and down the years Cochin, Colombo, Bassein, Daman, Chaul and Diu acquired mint houses of their own. The Casa da Moeda of Goa also happens to be the only Portuguese mint house of the colonies still standing today. Initially, the mint was based in Velha Goa or Old Goa, but in 1834 Dom Manoel de Portugal e Castro, Viceroy of Goa, had the mint shifted to Nova Goa or Panjim. It is said he was unhappy with the quality of the coins and therefore wanted to supervise the production himself. Since the coins were struck manually, the transfer of the mint posed no great trial. Rupias and Pardaos of silver and copper Reis of denominations of 10, 5 and 3 were issued to celebrate the establishment of the new mint. Incidentally, Reis, which is the plural of Réal (royal), is Spanish and is reminiscent of the 1580 defeat of Portugal by Spain. It is interesting to note that the mint was relocated about the same time Dona Maria II was reinstated as ruler of Portugal after her uncle, Miguel, was ousted by Pedro IV, Dona Maria’s father. Pedro IV had previously abdicated in favour of his daughter following which Miguel had deposed Maria II and usurped her position. In 1835, all coins bearing Miguel’s facsimile were withdrawn from circulation, being replaced by coins bearing the representation of Dona Maria II. By the 1878 Anglo-Portuguese Convention, British Indian mints took over the minting of coins for Portuguese territories in India and introduced uniformity in the coinage. The superiority of the British made coins was startling in contrast to the irregular and poorly designed Portuguese Indian coins which had no edge-milling and could easily be debased by shaving off the metal. The Anglo-Portuguese Convention of 1880 allowed for the minting of coins destined for Goa at the Calcutta and Bombay mints. A significant monetary reform as a result of this convention was that the rupia came to be replaced by the escudo in late 1958. Lower denominations to form the escudo were called centavos. Six escudos would make a rupee. The British issued coinage for the Portuguese in Goa that was the same value as the rupees, annas and pies in British India. 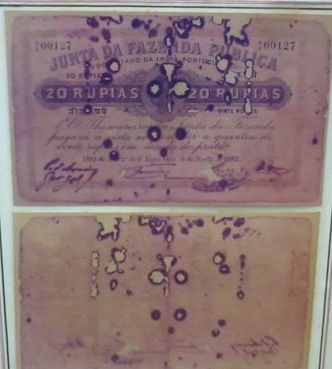 When Portugal became a republic in 1910, cupro-nickel alloy began to be used to mint rupias and bronze for tangas. In 1883, the first paper notes of 5, 10, 20, 50, 100 and 500 were printed in London. But these were withdrawn and the next two series were printed in Panaji and had denominations up to 50. You will find 5 rupee notes were printed only on one side at this time. From 1906 onwards, the currency notes were once again printed in London. The legacy of Casa da Moeda lives on through Dr Luis Dias, a passionate numismatist. Since 2009, the Casa da Moeda Festival has been organised by the Dias family, keeping alive history and revving up the interest of lovers of coinage at large.